CPI’s industry-leading two post relay racks support equipment and cabling with unsurpassed strength, stability and durability. Two-Post Racks have a small footprint that saves floor space. Racks provide unrestricted airflow for maximum ventilation and provides easy access to cables for moves, adds and changes. Select from a large variety of styles, sizes and accessories for various configurations. 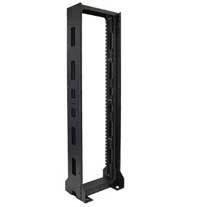 High static load ratings and a seismic two-post rack provide equipment mounting flexibility. Bonded assembly – paint cutting assembly hardware added to bond components. Integrated ground studs – prepared grounding location added to the rack channel (one side) with two 1/4” studs, spaced 5/8” apart for quick and easy attachment of standard ground lugs. 52U on 8’H racks – was 51U, an additional U space for equipment. Available in Glacier White finish – now a standard color, matches CPI Cabinets. Rack Ground Jumper Kit (ordered separately) – allows easy attachment to Telecommunications Grounding System, new kit includes: 9’L (2.7 m)Ground Jumper with attached ground lug, Antioxidant Joint Compound and hardware for attaching the jumper to the rack. Four-Post Racks offer the strength and stability of a freestanding cabinet in a cost-effective open architecture. CPI four-post racks offer the strength and stability of a cabinet in an open architecture and are available in a variety of styles. QuadraRack frames feature threaded equipment mounting rails while ServerRack frames have square-punched rails. Four-post racks provide easy access to cabling and equipment and unrestricted airflow for ventilation. They also permit the addition of a wide variety of CPI vertical cabling sections. 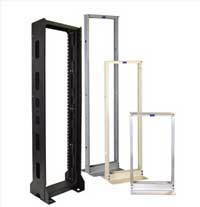 CPI offers a variety of seismic products for two- and four-post rack systems. Seismic Protection Systems from CPI are required and used in many parts of the world to reduce the risk of equipment damage from seismic events. Earthquake design criteria specifies that equipment must remain operational when subject to earthquakes even though some small amount of repairable secondary physical damage may occur. Excessive motion that may cause undue strain on cable or conduit interconnection is not permissible in this environment. Prevents back-and-forth, side-to-side and up-and-down movement of shelf-mounted equipment. Heavy-Duty Top Angle creates a heavier top and better rack stability; 2” instead of 1.5” deep. Universal Earthquake Bracing Kit is used for bracing the top of the rack to the wall or ceiling.Made of steel finished with Gold Chem Film over zinc plating.Threaded drop rod and additional hardware needed for installation. Adjustable Rack Bracing Kit secures Universal Rack to the wall to minimize movement. In addition to the Two-Post and Four-Post Racks offered by Chatsworth Products there are a variety of additional products which work in conjunction with and enhance the value of these structural support systems. Velocity™ Standard Pack – Velocity™ Cable Management plus Standard Rack and installation hardware in one convenient package. 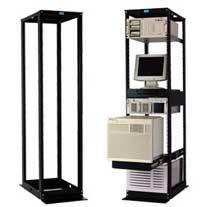 Single Rack Enclosure – Add doors and panels to an existing two-post racks. 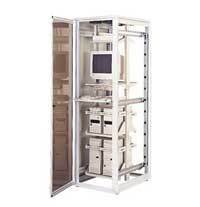 Enclosures are available for single racks or for multiple bayed racks and cabling sections. Enclosure cooling products also are available to help ventilate equipment. ExpandaRack Kits – Converts a two-post rack into a four-post frame. Two #12-24 tapped rails and top and bottom pans are included . Top and bottom pans available without rails to convert two existing two-post racks of the same height into one four-post rack. 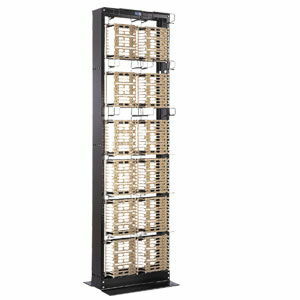 High Density Patching Frame – the benefits of a two-post open rack and vertical cable management in one unit. Designed to maximize the support of patch panels and a high density of cables. Structured Termination Systems – for high-density 110- and 66-style blocks. Support of termination blocks used for voice cabling and in situations that require few cable moves, adds and changes.